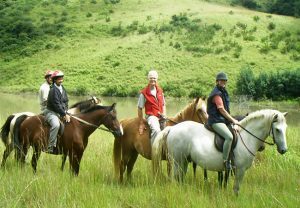 The UK is overflowing with stunning landscapes, from picturesque beaches to captivating forests, which makes it easy to get out and about with your horse and indulge in the great outdoors. The following five destinations have been chosen to guarantee a memorable adventure for you and your faithful companion. The UK’s original national trail stretches across miles of rugged, yet breathtaking terrain, through the beautiful scenery of the Peak District, the Yorkshire Dales and the Northumberland National Parks. This purpose built, well-marked and predominantly off road course incorporates ancient pack horse routes, droveways and newly built bridleways. Magical woodlands, a striking coastline, rolling heathlands, and the famous wild ponies, combine to create an unforgettable setting for horseback riding. The route is littered with welcoming pubs and friendly livery establishments, allowing ample opportunity for relaxation and enjoying the scenic surroundings. This timeless location offers a true escape from the hustle and bustle, guiding riders through undiscovered gems of the Welsh countryside. If you’re seeking a tranquil remote setting, gorgeous vistas, copious flora and fauna, plus a sprinkling of charming lakes, head to Radnor Forest for a glorious reminder of nature at its untouched best. Scotland is simply inundated with spectacular backdrops, with the Cairngorms National Park, nestled into the Highlands, providing the perfect introduction to the nation’s unadulterated beauty. This is apparently the spot where pony trekking first took off, and makes an excellent locale for leading your horse past pristine lochs, crashing waterfalls and dramatic peaks. This wonderful trail along the Norfolk Coast rewards riders with staggering views, peaceful tracks, and acres of handsome moorlands and meadows. Part of the route occupies an ancient Roman road which meanders past adorable flint villages and tiny harbours, and grants a home to an incredibly diverse range of wildlife.